In the famed British Museum in London, England, stands a six-foot black basalt Assyrian monument inscribed during the reign of King Shalmaneser III in 841 B.C. Here is evidence of the accuracy of the Biblical historical record. 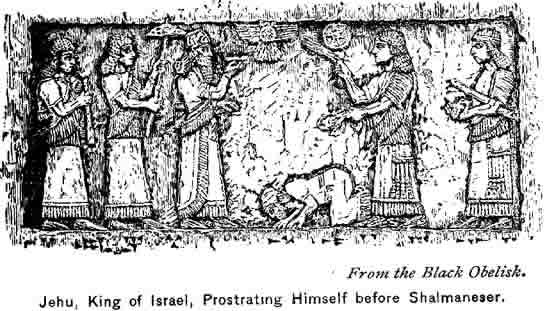 In the photograph to the left, on the second panel on the left side of this Assyrian monument, an Israelite king bows before his Assyrian overlord. 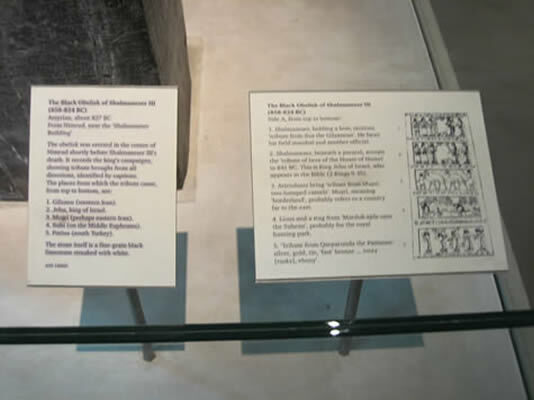 The British Museum description seen on the right placard photographed below, under the heading for Side A, second panel, states: "Shalmaneser, benearth a parasol, accepts the 'tribute of Iaua of the House of Humri' in 841 B.C. This is King Jehu of Israel, who appears in the Bible (2 Kings 9 & 10)." YA-U-A: Noted scholar, Dr. C.F. Burney, in "The Book of Judges," Ktav Publishing Co., NY 1970, p.245 says, "The element Ya-u, as the first element of a proper name, appears in Ya-u-ha-zi, the Assyrian equivalent of the Hebrew Jeho'ahaz, i.e., the Judean king 'Ahaz, in an inscription of Tiglath-pileser IV (cf. Rost, Tiglath-pileser, p.72). The form Ya-u-a occurs as the representation of the name of the Israelite King Jehu, in the inscriptions of Shalmaneser III (cf. KB.i, p.140, p.150). The shortening of Ya-u into Ya as the first element of a proper name is seen in Ya-ma-e-ra-ah." The first mention of Hebrew King David ever discovered on an archaeological find was the Tell Dan Stela, a stone monument from the ninth century, B.C., found in northern Israel. It has been dated to approximately 852 B.C. The inscription includes the words, "bytdwd," meaning "the house of David." The text also speaks of "the king of Israel." The inscription includes the names of two other Hebrew kings: Judahite King Ahaziah, whose name in Hebrew was "Ahazyahu." Ephraimite (ten-tribe House of Israel) King Jehoram's name is given as "Yehoram." See the article in Bible Review 11/6 (1995) pages 26-35, where this information is documented. The two houses of Israel, two-tribe Judah and ten-tribe Ephraim, were separate nations through most of their history, and differed in language dialects, cultural details, calendars, and some religious rites. It is interesting and important to note that the Tell Dan inscription documents one of the many differences between the two houses of Israel: The Sacred Name in Judah was "Yahu" or full-form "Yahuah," while the northern House of Israel used the Sacred Name of "Yeho." The name "Yahweh" was a later development of the Sacred Name. It is also significant that the Druidic order in early Britain worshipped "Yeho," showing a Hebrew-Phoenician connection due to trade and colonization. See the information given on our research pages.